Left in the bathroom, tucked in a bag, forgotten in a school van — guns belonging to teachers or school officers have been left out or accessible to students in America at least 60 times in the last five years, a study has found. There were no accidental deaths, but some people were injured, according to the report released last week by the gun-control group Giffords. Using news reports, the group tallied the number of times a gun was left out, accidentally shot, or mishandled during a disciplinary episode or stressful situation. Most incidents ended without any shots fired. The study comes after a year of renewed debate about whether teachers or school employees should be able to carry guns — driven by school-safety debates after the Parkland, Fla., shooting and the Trump administration’s consideration of allowing states to use federal funding to arm teachers. Three of the incidents cataloged were in Pennsylvania. At the Russell Byers Charter School in Center City, a middle-school student bumped into a staffer’s bag during a class last year and realized it contained a gun. The staffer was suspended. At a Washington County high school, a student found a loaded gun that a security guard had left in the bathroom. In Chambersburg, Franklin County, a group of elementary school students found a teacher’s loaded gun on top of a toilet. Giffords and others opposed to arming school workers point to incidents like these in arguing that a teacher or employee carrying a weapon makes everyone more vulnerable to accidents, shots fired, or kids getting hold of guns. He said having guns on school premises can “subject students to trauma [and] disrupt their ability to learn” in addition to making the environment less safe. Those who support arming teachers say incidents like these won’t happen with proper training. They argue that a quick response is the only thing that can potentially stop an active shooter. Last year, a Schuylkill County school district passed a policy providing for teachers and employees to carry firearms in the district’s four schools, saying it would make the students and staff safer. The decision by the Tamaqua Area School District caused a tense debate in the small town. 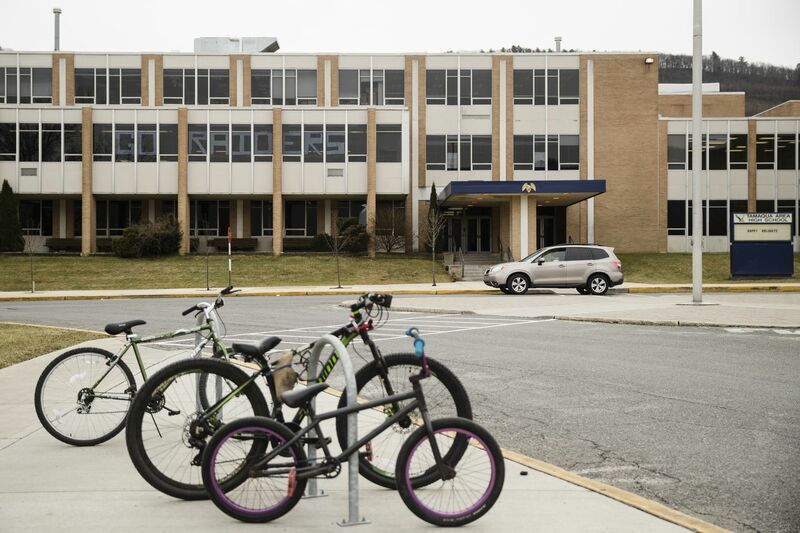 In January, the district suspended the implementation of the policy after the teachers’ union and a group of parents separately sued the district. They are still awaiting decisions in those cases. In some states, teachers or employees have been armed for years. Many of them are in rural areas, like Tamaqua, where it could take longer for police to respond. “We have to let the bad guy know that they are hardened,” President Donald Trump said in arguing for fortifying schools in the wake of the Parkland shooting. Other incidents cataloged by Giffords included the time a drunken kindergarten teacher in Georgia brought a loaded pistol to school in her purse; police officers who left a pistol on a Georgia playground after a K-9 demonstration; and multiple instances of people leaving guns in bathrooms. Some include accidental shots: A substitute teacher in Alabama had a gun in his pocket when it accidentally discharged, leading to one student being struck by a fragment. In Virginia, a parent brought a gun to school that went off and hit a woman in her lower body; she survived. At two schools in Florida, police officers have accidentally fired a weapon when responding to a lockdown.